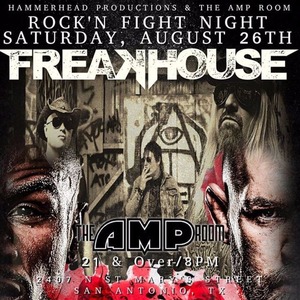 Rock'n Fight Night 8.26.17 at The Amp Room with LIVE music performed by national recording artist Freakhouse from Los Angeles, CA. Ticket guarantees entry into the venue. SEATING IS NOT GUARANTEED AS SEATING IS FIRST COME FIRST SERVE AND IS LIMITED. Includes bands before the fight with music by Freakhouse and more. All fights will be on all TVs and big screen. Live music played during under card fights. Fight commentary for main event only. Freakhouse is an American rock band from Los Angeles, California consisting of lead vocalist and bassist Rob Escher, guitarist Matt Clark, and drummer Scott Freak as seen on Travel Channels "Ghost Adventures" this past April 2017. The group's latest release, Angels in Chemistry, released August 12, 2016, through 7Hard/Membran. Floyd Mayweather Jr. vs. Conor McGregor, billed as "The Money Fight", is an upcoming professional boxing super-fight between undefeated eleven-time five-division professional boxing world champion Floyd Mayweather Jr. and the current UFC Lightweight Champion Conor McGregor. It will take place at the T-Mobile Arena in Paradise, Nevada on August 26, 2017.